Amherst’s sea cadet corps has benefited from the inaugural ‘A’ Fresh Start Community Initiative. On Jan. 15, the cadet corps received a $102 cheque from the Town of Amherst, money that was raised from those who purchased ballots for $2 during last October’s event that was organized by the town to encourage organizations or individuals to develop new events or enhance existing ones. 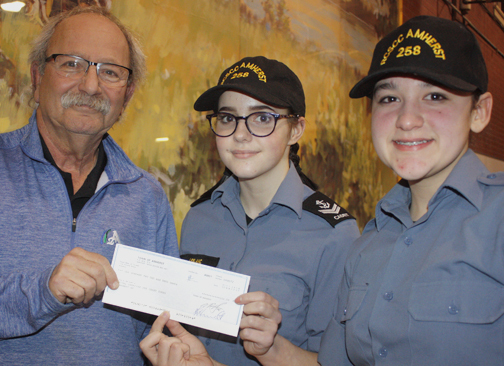 “From the beginning, it was council’s intention to donate the money raised via the purchase of the ballots to a worthwhile organization within the town,” Mayor David Kogon said, after presenting the cheque to Master Seamen Jessie LeBlanc and Samantha Aylward, members of 258 Royal Canadian Sea Cadet Corps Amherst. Navy Lt. Helen Triff, the cadet corps’ commanding officer, welcomed the donation. Three organizations vied for ‘A’ Fresh Start Initiative grants during last October’s event. The Amherst Heritage Trust, the Valentine Run Committee and the Sexual Health Centre for Cumberland County made presentations to members of the community who attend the event. Those who were 16 years old or older and purchased a $2 ballot then voted in order to determine the rankings of the presentations. In the end, all three organizations received ‘A’ Fresh Start Initiative grants. The trust used theirs to hold an Evening of Art and War at the Amherst Armoury last November. The run committee is using their funding to add a one-kilometre run to their annual event that will be aimed exclusively at students in grades 4-6. The run is scheduled for Feb. 16. The Sexual Health Centre is using their grant to hold a youth engagement forum that will facilitate broader awareness of sexual health outcomes among the area’s youth. Planning for the next ‘A’ Fresh Start Initiative is currently underway. Details will be released at a later date.